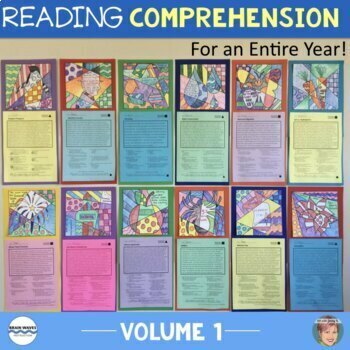 Other reading comprehension volumes available (each volume covers different holidays, has different images and also cover different reading strategies each month). Together Art with Jenny K. and Brain Waves Instruction like to put the ART in Language Arts. 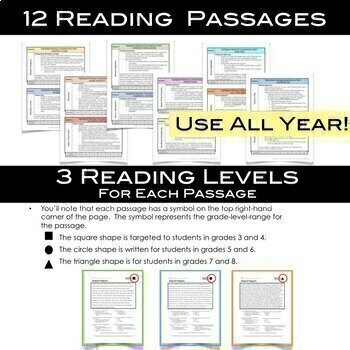 That is why we have teamed up to bring you a fun, creative and innovative way to use nonfiction reading passages as you support 21st century skills in your classroom all year long! 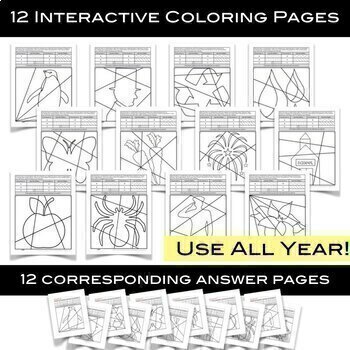 These coloring pages aren’t your standard color by answer pages. The final artwork will be as unique as the student that created it. 1. Read the nonfiction passages. 3. Turn the answers into unique art! This resource will complement any reading instruction or holiday celebration you are planning for your classroom. It would also look great with my We Heart Reading collaboration poster. 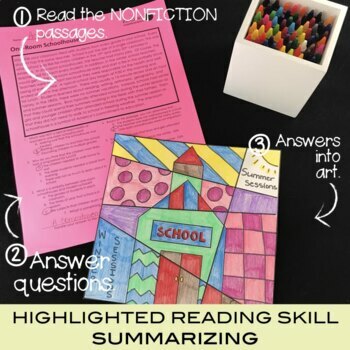 Each passage targets a critical reading comprehension skill. Each artwork coordinates with the reading passages for different holidays and seasons of the year. You can use them in succession or pull them out of order and use them in a way that works best of you. Start using this no prep resource any time of the year and use it all year long! -Colored pencils, crayons or markers in regular primary and secondary colors. Other Collaborations Brain Waves Instruction and I both believe in the power of Art Integration. We have co-authored many resources. Here is a list of some of our favorites. Or look HERE to pair Art with Jenny K. resource with Brain Waves Instruction resource to create the perfect art integration experience for your students. Help me keep the price of this resource low by purchasing additional licenses for any teacher you would like to share this lesson with. Extra licenses are discounted. © Copyright 2017 Art with Jenny K./Jenny Knappenberger ALL RIGHTS RESERVED. Permission is granted to copy pages specifically designed for student or teacher use by original purchaser or licensee. The reproduction of any part of this product is strictly prohibited. Copying any part of this product and/or placing it on the internet in any form (even a personal/classroom website) is strictly forbidden. Doing so is a violation of the Digital Millennium Copyright Act (DMCA).